Your Ultimate Pinterest Checklist is on the way! I have a special offer for YOU! As a former educator, I KNOW that it is so much easier to learn when you see exactly what you are supposed to be doing. 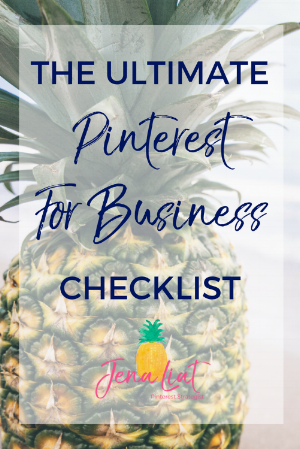 I have created a short video and a workbook to help guide you through getting Pinterest set up to drive traffic to your website and converting into sales and clients! Pinterest Success is a quick and simple workbook and video that will SHOW you exactly what you need to get started building your Pinterest account for your business. Pinterest Success is a no fluff, step by step guide and video of me showing you in Pinterest HOW to do everything. Right now Pinterest Success is available for $25, it is regularly $97! > How to create a bio that draws people in from their first glance at your profile. > How to create top ranking boards in searches so your ideal audience finds YOU. > How to write the perfect pin descriptions so that your pins are popping up in searches AND on your ideal audience's smart feed generated by Pinterest. > How to find relevant key words to fully optimize each pin and board for search. AND a freebie showing you how to set up the showcase feature on your profile to highlight YOUR best content! This special of getting Pinterest Success for only $25 is only available for 15 minutes, so don't delay!